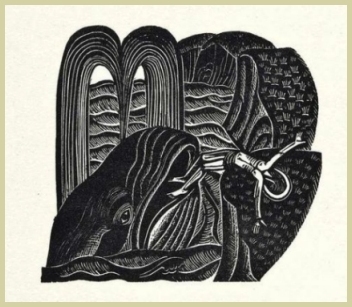 The Book of Jonah contains 13 wood engravings by Jones. It was originally published in 1926 by The Golden Cockerel Press, and reprinted in 1979 for Clover Hill Editions by the Rampant Lions Press. 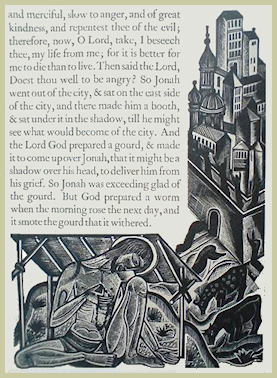 Here Jones is becoming master of his craft, with the images designed to both enhance and complement the text. 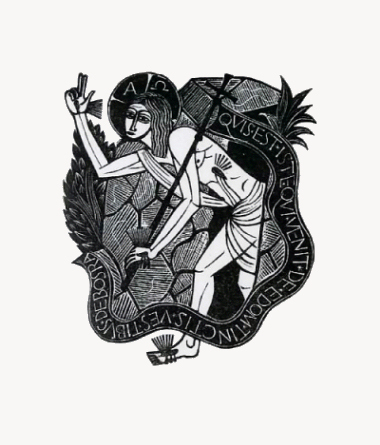 All images are © Estate of David Jones and from private collections. offered a sacrifice unto the Lord, and made vows. The blocks were cut with the text in mind. The page proof to the left results in the final printed page at right. Below are illustrations from page proofs. 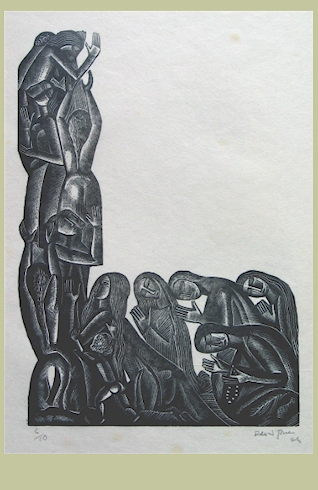 While we still find echoes of the medieval woodcut, we can see that Jones has developed a strong, modernist line to use in the telling of this familiar tale. 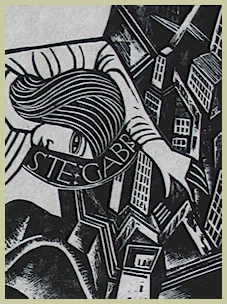 In the upper right corner of the image with Gabriel, the depiction of Ninevah also functions as an expressionist depiction of a large modern city, complete with the stark shadows of pedestrians walking between the skyscrapers. not upon us innocent blood: for thou, O LORD, hast done as it pleased thee. 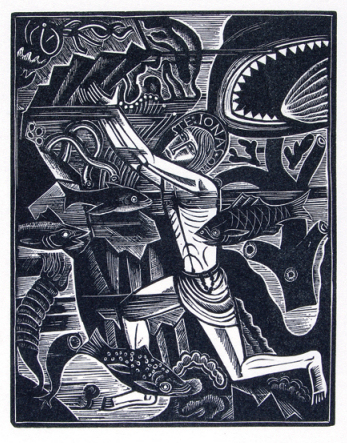 Booksellers and auction houses offer glimpses on the net of The Book of Jonah. Below are samples of the 1979 Clover Hill Edition from McLean Arts and Books, and a sample of a privately bound copy from Bloomsbury Auctions. 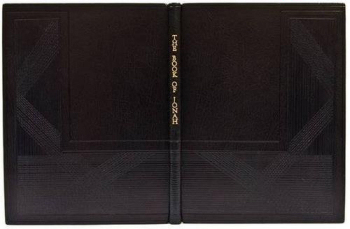 THE BOOK OF JONAH Clover Hill Editions, London, 1979. quarter cloth. Second Edition. 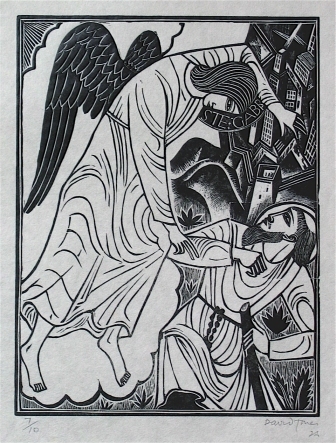 19pp: A beautiful realization (effectively the second edition) of the 1927 original published by the Golden Cockerel Press, and a companion piece to Jones' later and more widely known "Chester Play of the Deluge" (1928). 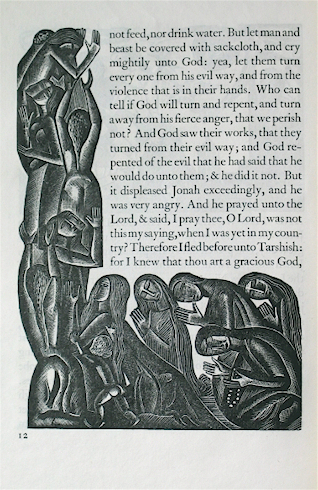 The text is taken from the King James version; Jones' woodcuts are printed from the original woodblocks; printed on heavy mold-made papers, bound in patterned paper boards with cloth spine. Printed at the Rampant Lions Press by Will Carter for Clover Hill and published in a LIMITED EDITION OF 470 COPIES (here, no. 54), in immaculate condition. Very fine. number 78 of 175 copies on Batchelor handmade paper, wood-engraved title-vignette and illustrations by David Jones, some full-page, bound in black goatskin, by J.Franklin Mowery, ruled and blind-stamped L-shaped block on each cover and running across spine reflecting the format of the double-page border illustrations in the book, spine titled in gilt, edges of boards ruled in gilt, uncut, original printed and illustrated upper wrapper of dust-jacket bound in at end, signed "JFM '94" at foot of rear turn-in, board slip-case, 4to, 250 x 190mm., Waltham St.Lawrence, Golden Cockerel Press, 1926. One of the most limited of the press's productions. 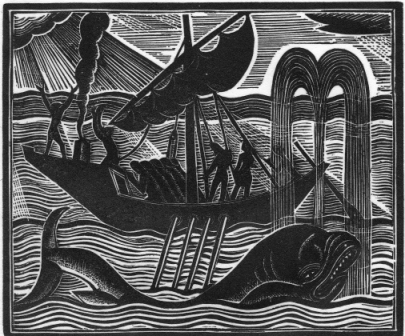 According to the binder the linear aspect of the blind-stamping reflects the storm which caused Jonah to be cast overboard..